Last week, as part of our nonfiction study, we looked at how to paraphrase sentences. Paraphrasing is the process of putting ideas from the text into your own words. It's an important skill, one that is used across the content areas as students write summaries, take notes, and answer questions about text. Being able to replace words with synonyms-This means that readers need to have a wide range of vocabulary. When paraphrasing nonfiction, readers especially need to understand general academic vocabulary. Being able to rearrange sentences-Readers need to be able to change the order of sentences and ideas. Both of these are hard for fourth graders. Our first step is to look at how we can rearrange sentences. I showed students a sentence with an underlined prepositional phrase. At the South Pole, no plants can grow. The seas around Antarctica are filled with tiny plants called phytoplankton. The United States operates three research stations in Antarctica. What words could we use to replace the word "operates"? Students came up with several that work--runs, keeps, has. Then we looked at what words we couldn't change in the sentence, like research stations. This phrase has a very specific meaning with no real synonyms. This also highlights the role of background knowledge in paraphrasing. When kids have well-developed knowledge about the topic, they have a better idea of what can be replaced and what needs to be kept. Finally, kids tried to put it all together to paraphrase a few sentences. It takes some time to teach, but students respond well to the instruction. When we work on summarizing after the holiday break, our task will be much easier. 1. Work with students to develop their academic vocabulary. The Academic Word List by Averil Coxhead is a great resource for this. 2. Show students how to move ideas around in sentences. This could fit in during writing instruction or even handwriting time. 3. Work with sentences that relate to content. Kids need to have some background knowledge about the topic in order to paraphrase successfully. In fact, when readers are having trouble paraphrasing, that's a good indicator that comprehension just isn't happening! The underlying thinking: Kids have many problems with understanding causality. If students are having trouble finding causes and effects in real life, they will also have trouble with causes and effects in text. Multiple causes, multiple effects: Depending on the topic, there can be multiple causes and multiple effects. Readers need to be flexible in their thinking as they read. 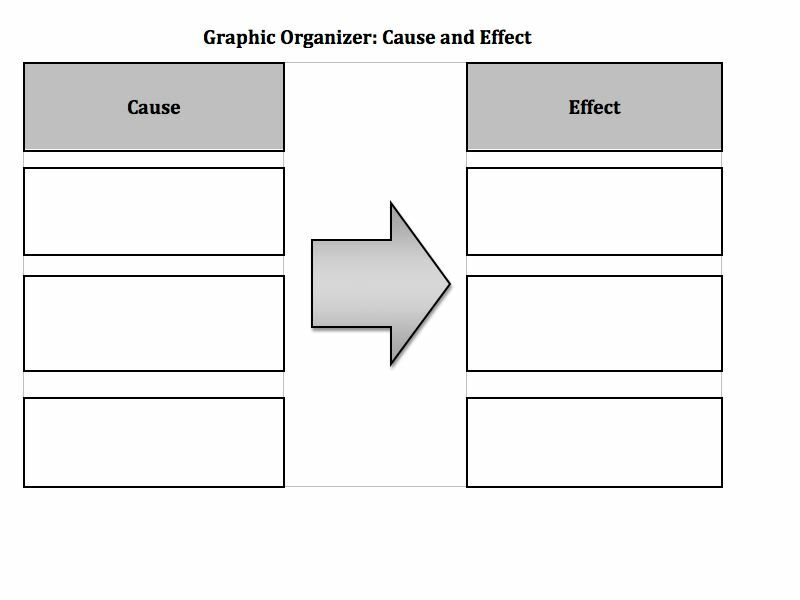 Tricky graphic organizers: If you are teaching students to map out ideas on a graphic organizer, cause and effect may lead to some problems. 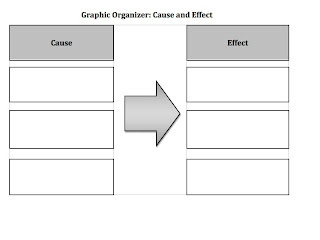 You may need to customize a graphic organizer for a text, matching the number of boxes to the number of causes and effects. Or you may want to have students draw their own depending on the text. If you use a generic organizer, be ready to tell students, "You don't have to fill in all the boxes" or "You may need to add some boxes"--over and over and over again. Changing order: In real life, causes come before effects. But authors sometimes start a paragraph with an effect. For example, in Extreme Animals, author Nicola Davies often describes the inhospitable environment that an animal can live in--the effect--and then explains the adaptations that the animal has to live there--the causes. The cause is that the animal has many adaptations; the effect is that the animal can survive. Here is a great little book that uses a clear cause and effect text structure. On each spread, the author describes an invasive species, explains how it arrived in the new habitat, and outlines the effects of the invader. Working in groups or at a center, students could map out the causes and effects on each spread. Reading about Antarctica creates the perfect situation to help students learn more about how to change their prior knowledge. In general, readers don't like to change their ideas. With students, this means that they often cling to faulty prior knowledge. Kids have many faulty ideas about Antarctica. Most of them think that polar bears do eat penguins, that lots of snow falls in Antarctica, and that there's no need for sunglasses or sunscreen. How do I help them to change these ideas while reading nonfiction? So I can't just sit the kids down and say, "Hey, kids. Guess what? Polar bears don't eat penguins." Instead, I need to build situations that create an internal mismatch in students' schemas, so that they experience the feeling of resolving this conflict. Our Antarctica readings are perfect for this. Is it working? Listen to what a student said on Friday: "I know that there aren't any plants at the South Pole. And if there are no plants, there can't be any animals, right? So why is there a research station there? What would they study*?" This student was putting together related bits of information and identifying the conflict. What great thinking! This is the payoff from reading multiple texts on the same topic--kids have the time and space to think about what fits, and what doesn't. Shared knowledge building-My students don't have much prior knowledge about Antarctica. As we learn about it, then, we can experience the feeling of adding to our schemas together. It's fascinating to see how kids pick up on new words and share their experiences. For example, the word "skuas" came up in two different texts. A skua is a kind of bird that lives in Antarctica, but most students had never heard of it before. When one student found a picture of a skua in a book, the others were eager to see it--I overhead one say, "Oh! A skua is a bird!" As we read multiple texts, then, we all can experience adding to what we know. Students filled out an anticipation guide at the beginning of the unit. Then, after each text, we go back to see if our thinking has changed. Sometimes, what we find is surprising, like the fact that visitors to Antarctica need to wear sunglasses and sunscreen! Interesting texts-In the Toolkit Texts from Heinemann, there is a nice nonfiction first-person piece about doing research at Palmer Station, as well as a map of Antarctica. (By the way, the map is available as a free sample on the website.) These texts started my unit. Since then, I've found additional books. Jennifer Owings Dewey's Four Months at the Bottom of the World is a nice example of personal journal text, while the Magic Treehouse Penguins and Antarctica book gives kids a thorough introduction to the continent. Online resources-This blog is documenting the LTER Cruise that is about to begin for the new season. LTER means Long-Term Ecological Research, and these scientists return to the same places each year to see how things have changed. At this link, you can find other resources. And there are plenty of videos as well. When I have written to researchers with questions, they have responded...how neat! Penguins and other cool animals- My students are fascinated by penguins each year. They like to pore over the encyclopedia of penguins that I check out of the local library, look at the names of the different types, and find out where they live. Not all penguins live in Antarctica, which is surprising for many of the students. My interest-When I started working with this topic, I knew very little about it. This helps to keep me interested! I admit to following the research season to try to learn more each year. I've learned all about the IceCube project at the South Pole and figured out how to tell the different kinds of penguins apart. This year, I want to try more of the resources from PolarTREC. 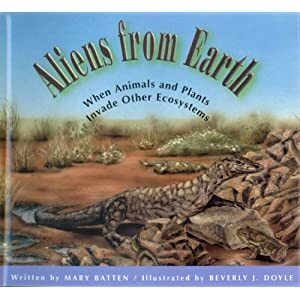 No matter what the topic, reading a series of interconnected texts helps students to make sense of nonfiction. Next week, kids are eager to read more about Antarctica--and I'm eager to help them! Over the past few weeks, I've been working on a project to put together a list of books to use for teaching text structures. The list is finally finished! I've posted the document on Slideshare. One of the hardest parts was finding books that have a common theme. After all, text structure is linked to content. The structure that an author chooses is connected to what ideas the author wants to convey. Using a scattered array of books, then, might not help students to see how ideas connect across texts. The text structure of description can go by various names. Some resources call it description; others call it statement and support; still others call it main idea/detail. Whatever it is called, this text structure is based on making a statement, and then supporting it with details. The buttonbush is a plant that can be found along many rivers and streams. Although it can reach 15 feet tall, it usually only grows a few feet. Its flowers, about the size of a ping-pong ball, bloom through the summer. The flowers are replaced by brown, ball-like fruits in the autumn. In the past, I've found description to be the easiest text structure to find,whether in textbooks, trade books, or magazines. One especially nice series is published by Peachtree. The latest one is About Raptors. All of the books in this series are written in a simple style. Each page contains only one sentence. There are about three main ideas in each book, supported by details. This book is an easy read, but the pictures and specific information make it worthwhile for read alouds even up through sixth grade. If you're looking for a place to start with description, these books would be a strong choice. 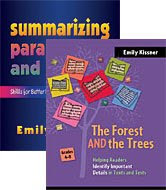 While it's been tough to find good books that sustain the compare and contrast text structure, I've found some great problem and solution books. One that is easily available is the title When the Wolves Returned. Why do I like this book? Like many recent nonfiction books, it's written on two levels. Simple text is included in white boxes, while the author goes into more detail in a longer paragraph. This two level readability makes it a good fit for most classrooms. I also like the way that the author interweaves causal relationships within the problem/solution structure. This is the way that text usually works. Problems don't just appear overnight; they have causes. The relationship between the causes and effects--and how they fit with the problem and solution--are very clear in this book. 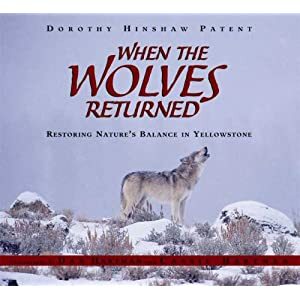 The first half of the book explains how wolves were eliminated from Yellowstone, and the effects of this elimination. This is the problem. Then, in the second half of the book, the author describes how bringing back the wolves has been a solution to the problem. Of course, to show how the return of the wolves is a solution, the author needs to explain the effects of the wolves' return. I can see this book working well as an introduction to the text structure of problem and solution. Even better, the endpages show an interconnected web of animal photos, with a caption inviting the reader to recall the effects that the wolves' return has had on each species. Pretty neat! In a way, it was the prospect of teaching students how to find main ideas that first led me to researching journal articles. It was 2000, I was teaching reading for the first time, and I realized that I didn't know enough about what happens when reader meets text. All I could remember were my own experiences with reading the SRA cards as a student and learning how to make good guesses about main ideas. And that wasn't enough to help the sixth and seventh graders I was facing each day. In the years since, I've learned a great deal about readers and main ideas. But even though I have read the journal articles, worked with hundreds of students, and even written chapters about finding main ideas, each year is still a challenge. Because, in the end, finding main ideas is not about what I know in my head, but about what I can help my readers to experience and learn. The topic of a paragraph is the word or phrase to which all of the other ideas refer. Even though I thought that sixth and seventh graders could find the topics of a text with ease, I learned that this was not always the case. Sometimes, readers will circle the most concrete or tangible idea, not necessarily the one that is the topic. If the topic is more abstract--like watersheds, or succession, or forms of government--students will often fail to identify it. When students confuse topic with main idea, this is the best way to show them that there is a real difference. You can do this with two opinion paragraphs that state vastly different opinions, or simply two paragraphs that communicate information about the same topic in different ways. Like the discrepant event in science (an activity that forces students to reconsider their prior knowledge), looking at these two paragraphs can help students to rethink the rules they've formed for what a main idea can be. My work with the SRA reading packets, back in my student days, taught me one important rule--the first sentence is usually the topic sentence. Right? Well, in real text, this is not always the case. Newer digital texts often have main ideas partially stated in headings (like this list you're reading right now), stated at the end, or even left unstated. Make sure that your examples reflect the real-life world of text, even bad text. Finding main ideas is hard! Young readers often read at the "local" level in a text, relating each sentence to the one before it and after it. Older readers often adopt a more global reading habit. Main idea is often a tough concept for third, fourth, fifth, and even sixth graders. As text becomes more complex, so do the main ideas, and a reader's task is even more difficult. Combine this with the fact that there is a great deal of poorly written, incoherent text floating around, and it's easy to see why readers have problems. 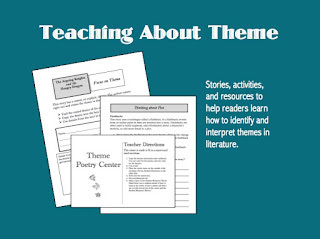 While I was gathering together items for my own unit on main ideas, about to begin next week, I put together this collection of texts, worksheets, and Powerpoints. 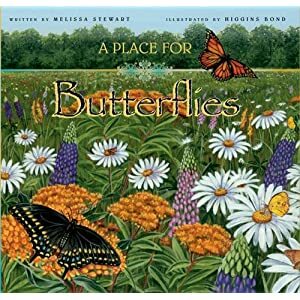 As part of a project for a children's literature class, I'm working on compiling a list of high quality picture books that show different text structures. But I've run into a problem with one particular structure--compare and contrast. Which--okay, it is useful to see how these animals are similar and different. But aside from these, there are not many other books that exclusively use the text structure of compare and contrast. Why not? I think it's because compare and contrast is a difficult structure to maintain over a whole text. In the real world of text, a reader is much more likely to see compare and contrast used in small amounts throughout a longer text. In a book about habitat loss, for example, a writer might use a bit of compare and contrast to show how a forest has changed over time. In a book about an invention, an author might compare and contrast previous attempts to solve a problem. In both of these situations, the compare and contrast text would help to explain the bigger point or structure of the text. One nice example of this is in the book Sea Soup: Phytoplankton by Mary Cerullo.The overall structure of the text is a question and answer format. However, within the answers, the author uses the text structure that fits the information. 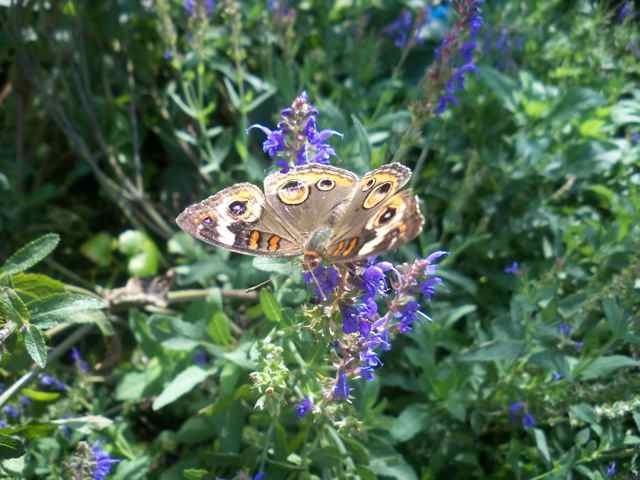 An answer to the question "Are they plants or are they animals?" leads to a section in which phytoplankton is compared with plants and animals. The comparison is somewhat implicit, signaled by the sentence, "Some phytoplankton behave like plants, some like animals, and some like both." This is the case with a great deal of real-life compare and contrast text--although we teach students to look for compare and contrast cue words, many authors use a more implicit style. What does this mean for classroom instruction? Well, I definitely will be checking out my library's copy of What's the Difference...? when I am working on the compare and contrast text structure. But I will also help students to find examples of this structure in longer texts, and to look for less obvious examples of compare and contrast. Helping kids to summarize nonfiction is hard. Not only do kids have to read and understand the text, but they also have to figure out what's important, how to put ideas in their own words, and how to organize the summary. No wonder kids have so much trouble! This Powerpoint can give you a place to start. (Some people watch late-night television when they're up in the middle of the night with a cold; I write Powerpoints!) It's short enough to do in just one class period, and can be either an introduction or a review. This slideshow presents four rules for summarizing, explains them, and models how to put them into practice with a short text. And there are lots of pictures of butterflies, too. As you can probably tell, I like making Powerpoints. Why? Well, it all comes down to brain science. My working memory has only about 7 slots. When you factor in taking attendance, dealing with announcements, writing passes to the nurse's office, listening to the pencil sharpener, and mediating student squabbles, my 7 slots are often at their full capacity--even before I've started the lesson! Here are the principles I keep in mind when making Powerpoints. White on blue I usually stick to very simple formatting, with no fancy backgrounds. I've found that white text on a blue background shows up the best, even with light coming in from the windows. I taught in an open space school for many years, and had no windows, so I am committed to keeping my blinds at least partly open all the time. I love my view! Using photos that are light in color also helps to keep everything visible. Duplicate slide I love the "Duplicate Slide" function found under the Edit menu. This works well for highlighting bits of text and showing answers to questions. You can see how this works in this paraphrasing presentation. Add assessment prompts Showing a Powerpoint shouldn't be a lecture. I usually have students sit next to a partner, with a journal or a piece of paper out to write answers to questions. Once again, this helps me to think about what I want students to do ahead of time. ("Mrs. Kissner, there's a stinkbug on my desk. Again.") In this Fact and Opinion presentation, students have to answer questions and work with the content throughout. Slides are free I like to have simple pages. Slides are free--why not make lots? Changing the slides frequently keeps students engaged. (I once went to a conference workshop in which the presenters had 15 different ideas written in tiny font on one slide. Why, why, why?) Also, using big text helps students to see from the back of the room. Speaking of the back of the room...Walk back and make sure that the students at the back can see. If students are having trouble, have them bring their chairs to the front. I also have students who like to sit on the floor with a clipboard. Use the remote Find the remote control for your computer, and use it. I couldn't stand to be chained to the front of the room with the computer! When I'm up and around, I can look at what students are writing, interact with groups, and add differentiation for students. Simple, simple, simple I keep the presentations very simple. I don't use many animation effects, mostly because they kind of give me a headache to look at. I want the content to take center stage, not the way that I'm delivering the content. Having some good instruction ready helps me to face the week more calmly! What other tips do you have for Powerpoints? Today, at the start of my whole group lesson, I held up the read aloud we've been working through over the past few weeks--The Magic Thief by Sarah Prineas. "Why do you want me to read this today?" I asked students. "Share your ideas with your partner." Well, the general consensus was that they wanted to know what happened. And this is what makes stories so compelling for readers--in the effort to find out what happens, they want to read on. When readers hit longer format nonfiction, however, they sometimes feel bored or disengaged. I'm not talking about the nonfiction with lots of big pictures and cool features. I'm talking about the longer articles and sustained text that transitional readers have to learn how to read. Many students aren't quite sure of how to negotiate the switch from reading to find out what happens to reading to learn something new. "This is where our questions help us," I told students. Then, I shared a chapter from a book called The Pledge of Allegiance. It's one that I picked up at a used book sale, one of those nonfiction books that stays in pristine condition because no one ever reads it. "Even if you think that you're not interested in the topic, you can ask yourself questions about what you think you might learn. Then, you're reading to try to find answers to your questions." I modeled with a chapter, showing how we can leapfrog from question to question, keeping ourselves interested even as the text got longer and more complex. Tomorrow, as students work on reading an article with a partner, we'll look at their questions and see if this strategy helped them to stay connected with the text. Going from reading to find out what happens to reading to learn new ideas can be a stretch...but it is a vital step for fourth grade readers. When my youngest son was three, the phrase "think ahead" really baffled him. 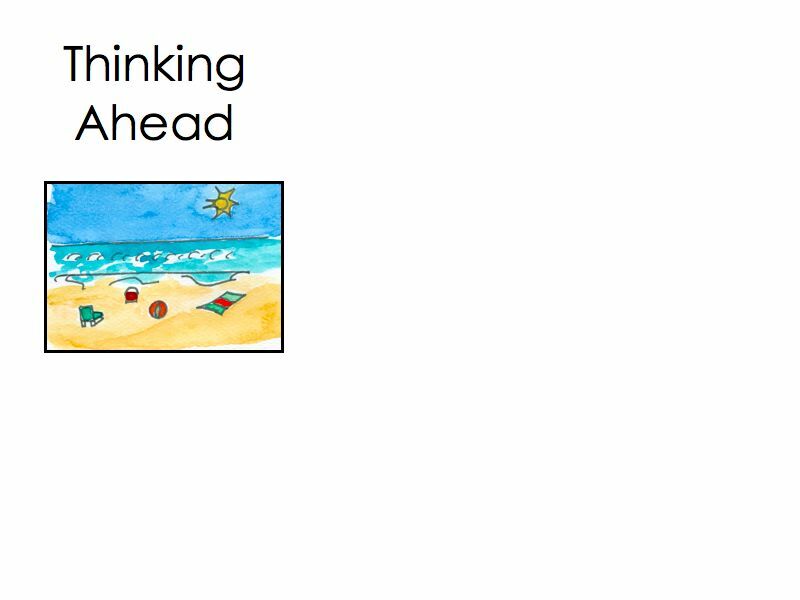 What does it mean to think ahead? I wrote a little book about this to share with him, and sent it along to a kindergarten teacher friend. I had forgotten about it until Aidan started kindergarten himself this year. I dredged it up from the computer archives, added some illustrations, and turned it into a projectable book. Instant gratification! You can download the compressed file, including the Powerpoint and the printable version, here. Today was the fifth day of school! For the first few days, I worked with the students to find "just-right" books. Now that they have settled into their books, the next challenge is to get them thinking about what they read. Yesterday, we made a chart to show all of the different kinds of thinking that readers can do as they read. (This is based on the "Reading Is Thinking" chart in Guiding Readers and Writers by Fountas and Pinnell.) Each student received a sticky note, and wrote one kind of thinking that they do while they read. Some students had some great ideas, like "making pictures in my mind", while others drew a blank. Still others knew important words, like "schema", but weren't sure of how to put this as a kind of thinking. Students shared their sticky notes and grouped similar ones together. After we talked about all of the different kinds of thinking that they can do while they read, I introduced the simple chart we'll use to keep track of our thinking. Then, I showed them how they can do this. Finally, they returned to their own books to try writing down at least one example of how they think while they read. In past years, I've been very encouraging on the first day, accepting almost every approximation. Today, though, I was a little choosier. One student wrote, "I am wondering what will happen next." Ah, the stand-by reading response! This fuzzy response plagues me every year. Not today, I decided! But it takes some work to help a reader figure out how to make this more specific. I said, "Let's try to make this a little more specific. Why are you wondering what happens next?" The student rattled off a pretty detailed explanation of the events of the page, so I knew he was following the story. (He was reading the second book of The Sisters Grimm--his third grade teacher had read the first book the previous year.) I said, "You just told me that Jack and Sabrina are fighting. Can you put that into a specific question about what will happen next?" He thought for a few moments, then said, "Well, Sabrina has a sword, and I wonder if she's going to use it in the fight." Much more specific thinking! I said, "Think about how much more detail you added! This really shows your thinking as a reader." As I start routines, I am always thinking, "What will this look like months down the road?" It's important to make sure that students aim for specific thinking, each and every day. Of course, today wasn't all about the winning. As the temperature climbed, I asked one reader to tell me what he was thinking. He looked at me, sighed, and said, "I was thinking about if you would let me go stand in front of the fan." Teaching reading in August is always an adventure! Here's a quick tip for organizing a classroom library--something that I just learned by trial and error. One thing that is always a problem early in the school year is that fourth graders often pick out the second, third, or fourth book in a series, instead of the first. When students pick a book that is later in the series, I often have to tell them that this isn't such a great idea, and we go to find the first book. Invariably we find that the first book in the series is already in someone else's hands, which leads to disappointment. Take the Dragon Slippers series by Jessica Day George. The second book, Dragon Flight, looks beautiful and inviting. But it will be hard to understand without reading Dragon Slippers. And the kind of reader who doesn't know enough about series books to realize that it's best to start with the first is the kind of reader who just can't jump into the middle of a series. I've solved this problem by pulling the later books of some more sophisticated series and keeping them on a special shelf behind my desk. Kids have to ask for these books. When I see that a student has been carrying around Dragon Slippers, for example, I know that she is going to be ready for Dragon Flight soon. My library shelves are less cluttered, and I don't have the problem of readers trying to read books that just aren't quite right for them. In short: Put out the first books in the series, but keep the later ones out of general circulation. They'll be easy to find when you see that a reader is ready for them, and kids won't pick them up by accident. Three more days...and then the students will arrive. While I'm sad to see the end of summer, I am starting to feel a little bit of excitement for the new school year. (Thank heavens!) I can't help but think about what I'm going to do the first day, scribbling down notes on whatever paper I can find. My focus for the first few days of school will be to help students realize how they can be great learners. Most of my fourth graders are a little anxious about the challenges of the new grade. I want them to get learning and feel successful right from the start. I've already planned to do the What's Missing game from the Think-ets set, probably during my first few science sessions. While my first day's schedule is not entirely finished, here are two things that I know I'll be doing. Distraction (from The Forest and the Trees): Too often, students don't realize that they have control over their attention. They allow themselves to be distracted by all of the little things going on in the room. I have to get students to realize their role in paying attention right from the start. After all, in my room, we can have two fans blowing, classes walking by in the hallway, birds chirping outdoors, and even the town's volunteer fire siren going off right down the hill. If students allow each little noise to be a distraction, they will have a very fractured learning experience. The game of Distraction is simple. A student reads aloud from an informational book. During the reading, I zoom around the room, trying to be as distracting as possible. The kids think that this is really funny! After the reading is over, I ask students five simple questions based on the reading. Their success depends on how well they were able to tune out the distractions and focus on the reading. Then we talk about how they were successful or not. Invariably, some students are good at this, and can explain their strategies to others. We try it a few more times so that students can try out the strategies and see success. Schema Maps: One of the tasks for the first day of school is a school tour. My fourth graders are new to the school, so a tour is definitely needed. This year, I'm going to combine the tour with a discussion of schema. Early in the morning, I'm going to ask students to try to create a map of our school, labeling as many features as they know. They will probably find this challenging! Then, we'll walk around the school with our original maps on clipboards. Students will be able to make changes as we go. When we return to the room, we'll make new maps to show what we have learned. This will be an introduction to schema. Students will have a concrete example of how they can add to and change their schema. And our school tour--one of my least favorite first day chores--will have an added dimension of learning. Well, it's taken most of the summer, but I finally finished a primary grade text structure Powerpoint. No more fighting about Powerpoints across the grade levels! This presentation focuses on five text structures: description, sequence, compare and contrast, cause and effect, and problem and solution. It includes quite a few example paragraphs and LOTS of pictures. The paragraphs are about a wide range of topics, mostly going along with whatever interesting pictures that I had. You'll find that some paragraphs are easier than others, but all of the topics are clear and concrete.